Res Ipsa Knit With Her: My Very First Sock! You're looking at it - my very first sock! I'm so proud. And no, it's not a matter of the photo being out of perspective, it is indeed a baby sock. I made it in my class at Stitches West taught by none other than Cat Bhordi herself. It is her Coriolis sock design. How cool is that? She is so very nice and friendly. She is down to earth. She loves to teach. She looks just like a normal human being. The non-knitter would never know that she is a goddess! Here she is holding my sock! The class was so much fund and Mom and I had a great time. We also enjoyed shopping at the market and I will soon show you some of the goodies I purchased there as soon as the rain stops so I can photograph them. You can see a sneak peak of the yarn I got to make a clapotis here. Unfortunately on Friday I got the flu and so had to miss the second day. That was a real bummer. However I'm finally feeling well enough to knit so the world will soon be a good place again. I don't think I'll make a second one of these socks because I have no intention of giving them to some sweet babe. I'm keeping my first sock like a trophy! I saw Cat but she didn't see me from the next table over at the banquet. I met her at her booksigning at Purlescence and instantly liked her. Congratulations on your first sock!!! It looks great and IS a trophy! 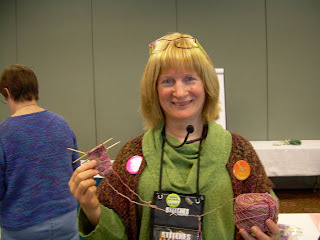 I had a class with Cat last June at TNNA and really liked her as well! Sorry to hear about getting hit with the flu and having to miss Friday. Can't wait to see pictures of the spoils! Nice sock. You could always knit the 2nd for a stuffed bear. And then he could wear your first shot at intarsia or fair-isle too. Or have you tried those? I haven't. Except for the fact that I'm not even posting great on my own blog, maybe I should join the KAL. I'm working on a Clapotis right now. I've dropped 3 or 4 times. =0) It's so fun to watch the progress. I can see why this is addictive. Your first sock looks fantastic and is definitely trophy worthy. Now you need to make a pair for you. We have had the flu running rampant in out house well mostly it is my duaghter she can't seem to get rid of it. Glad you are feeling better. What a cute little sock. So cool that you got to meet Cat! That sounds like so much fun. Can't wait to see what else you picked up while you were there. I'm sorry to hear you are down with the flu. I think something is going around. DH had it for over a week, and some other people have it too. I hope you feel better soon. 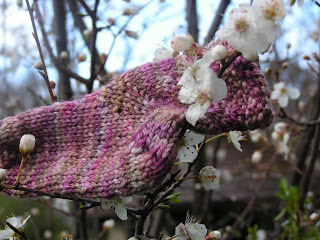 Congratulations on your first sock :) Plus its pretty awesome you got to knit with a famous knitter. Just think of the ( first sock) stories you'll be able to tell your grandchildren!! YUK, the flu? Now I am glad I did not meet up with you -LOL.. my friend, Julie, and I drove down Friday morning and came home Sunday morning..I turned right back around monday and drove my son to sanjose, he enlisted in the Army and shipped out Tuesday.. he's in OK now, then off to NM..he wants a helmet liner, socks and a pullover v neck sweater, which I got the yarn for last night!